A ceramic tile kitchen countertop can be a beautiful addition to your kitchen space and it can also serve a functional role as well. Ceramic tile countertops come in a wide range of styles, patterns, colors and designs; these ceramic tiles can also be combined in order to get a more decorative effect. However, ceramic tile countertops need to be sealed due to their increased porosity. Sealing is necessary in their case as it can assist with their stain resistance. Grouting is also important in the case of ceramic tile countertops and it has to be applied correctly in order for the ceramic tile countertop to stay functional and beautiful. A ceramic tile countertop can provide your kitchen space with an extra splash of color and liven up the whole space as its texture can make the difference for the way your kitchen looks. However, ceramic tile countertops come with several pros and cons that you should definitely consider when planning to have such a countertop installed in your kitchen space. Here are the main pros of ceramic tile countertops. First, a ceramic tile countertop will look fantastic in any kitchen as it can add texture, color and a valuable design focal point. Also, ceramic tile countertops add extra value to homes and this is to be regarded as a great benefit especially if you are planning to sell your house in the future to come. Character will be immediately added once you go for a ceramic tile countertop because this is the perfect way to inject some of your own personality into your kitchen space. 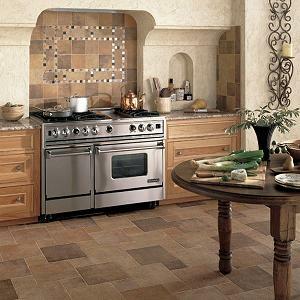 Also, ceramic tile countertops are durable and very resistant to scratches when they are glazed. Also, they are fire and water resistant and you need this regardless of your cooking skills. Some of the most significant bad points associated with ceramic tile countertops include the fact that they can be quite difficult to clean. For instance, if you spill something along your ceramic tile countertop, you must wipe the spill immediately in order to prevent further staining and reduce the possible damage as much as possible. A glazed ceramic tile countertop is quite resistant to a wide range of things but you should use a cutting board in order to prevent scratches and protect the surface of your ceramic tile countertop. Even if ceramic tile countertops do look magnificent, they are very expensive when it comes to installing them. Also, they are likely to take a longer time to install when compared to other kitchen countertops.